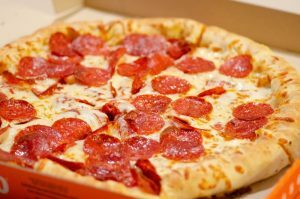 Today- Saturday, February 9th, 2019 Is Both National Bagel Day & National Pizza Day! * Today- Saturday, February 9th, 2019 Is Both National Bagel Day & National Pizza Day! As far as Jeff Eats is concerned, every day is National Bagel Day and National Pizza Day. Where will you guys be celebrating? 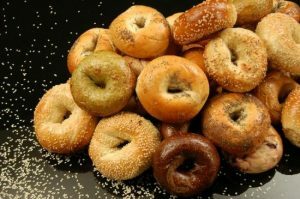 I love the bagels at Way Beyond Bagels in Delray Beach and Bagel City South in Boca Raton. I love the pizza at Nino’s in Boca Raton and Tucci’s also in Boca Raton. Love the bagels at Sage in Hallandale. Love the pizza at Anthony’s Coal Oven Pizza. Nick’s Pizza in Boca Raton. Villa Rose Pizza in Hollywood. BagelWorks Bagels in Boca Raton. Jack’s Pizza in Delray Beach. Brighton Beach Bagels in Delray Beach. Goldmans Bagel Deli in Key West. Mr. Z’s for pizza in Key West. I love Einstein Bros. Bagels and Thick & Thin Pizza both are in Boca Raton. My favorite bagel store is Original Brooklyn Water Bagel in Delray Beach. My favorite pizza joint is Dominick’s 1 in Boca Raton. ***** Original Frankie’s Famous Pizza, 9118 Bird Road, Miami, Florida 33165, (305) 221-0221. If you guys wanna eat off the chart- delicious pizza and garlic rolls, then you gotta go to Original Frankie’s Famous Pizza in Miami! Long story short, last night we got down to Frankie’s (which by the way, is basically a takeout joint), ate in the car (I know!- sounds very romantic! )- and if you haven’t been there, make it your business to get to Original Frankie’s Famous Pizza! ***** DISH OF THE WEEK (Sunday- 11/2/14). Don’t plan on eating at Original Frankie’s Famous Pizza because it’s takeout only. The joint only has 2 menu items, pizza and garlic rolls. You want great stuff!-order yourself a pie and some rolls-Frankie’s must be doing something right–the joint has been around since 1955. Original Frankie’s which has been around since 1955, is one of the greatest pizza joints on the face of the planet! Frankie’s is ALMOST-STRICTLY TAKEOUT, with 3 small tables outside in its rear parking lot- if you “”insist” on immediately eating your pizza! Frankie’s sells TWO ITEMS…PIZZA and GARLIC ROLLS…By the way, the garlic rolls are also incredible. ***** Bagels & Co., 11064 Biscayne Boulevard, Miami, Florida 33161 (305) 892-2435. I-now do you a solid–one of the best bagel-deli joints in all of South Florida…Bagels & Co.
Take a look at this joint’s website http://www.bagelsandcompany.com for menu/prices/photos. Now, we could sit and debate “who” makes the best bagels in South Florida…and never ever agree. Is it Sage? Is it Bagel City South? Is it Way Beyond Bagels? Is it??????? What I do know…if a bagel ain’t hand rolled, boiled and then baked…it absolutely-positively can’t be considered “best” of anything. The bagels at Bagels & Co. are hand rolled, boiled and baked. Now, I am not saying they are the best…but they are RIGHT UP THERE WITH THE BEST!!! I am telling you, the bagels alone make this joint…which just happens to be open 6am-4pm 365 days a year…a must try. I love food, especially, when I can buy it for less price than usual. Your blog is very helpful for me because of your uncountable number of posts about Gift Cards in different cafes. Thank you a lot for your work.